One of the cool things about going to the sketch outings is that you learn names of places you have seen from afar, but never gotten up close too. Instagram named my location as the Lewis Dreyfus Grain Terminal @ Pier 86. When I googled the name, it was for the Louis Dreyfus Corporation, a Dutch global food processing company founded in 1851 by a Frenchman named Leopold Louis-Dreyfus. He started by cross border trading cereal as a teen. 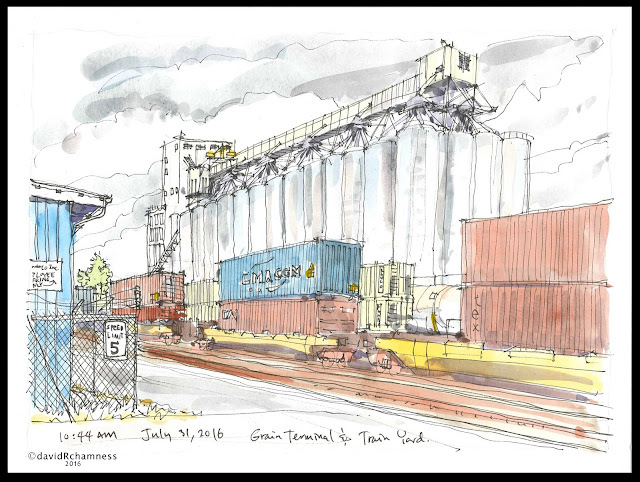 I have always admired the forms of the grain terminals and love the rail yards at Interbay, so Sunday decided to combine both into a sketch. One thing I discovered was all the parked train cars are really all being shifted every few minutes. I was glad I took a photo when I started because of the changes half way through my sketch. For my second sketch I just rotated in my seat to the north and drew the underside of the double helix bridge (i was sitting under it for the first sketch too). This was a very quick drawing, but I liked the looseness of it. Sometimes a time limit is a good thing, you don't over think the individual lines so much. I was off to an afternoon Sounders soccer game, so didn't get to share at the meet-up time. I like the angle you got on the silos. And your colors ... of course.